Every room in this walkout rambler has been completed updated! New roof, new Marvin windows, vaulted ceiling, commercial Wolf range, two fireplaces, master suite. Open floor plan with great flow and function. Beautiful custom design details including wainscoting, built-ins, ship-lap, bead board, tongue-in-groove, and reclaimed wood beams/pillars. Refinished hardwood floors. Generous back yard with privacy and enough space for a pool. Lower level includes a second kitchen/bar and a private bedroom – perfect for a nanny’s quarters or mother-in-law suite. 2-car tuck-under garage. Beautiful 2-story with wrap-around porch. Desired floor plan and double sized lot. Garage has separate office/workshop space with heated floors and separate bath. Very rare extra garage space. Wonderful neighborhood close to lakes and trails. Build your new home, cabin or getaway spot on this beautiful lot located on quiet Wildhurst Road. Level lot on dead-end street across from Lake Minnetonka. 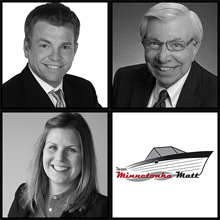 Beautiful upper bracket neighborhood -- one of Lake Minnetonka's most prestigious streets. Dock available thru city; access to dock thru back of lot. Minnetonka Schools. ORONO SCHOOLS! Build now and be in your new home for opening of school. Desirable corner lot with views of Lake Minnetonka. Close to walking trails (walk to Wayzata), Woodhill CC, & Orono Golf Course. Minutes from Wayzata, 394. Open to all Builders. Plans available. 2100 Webber Hills Drive, Orono - Price Reduced! Spacious and inviting 2-story on beautiful 1 acre lot in desirable Webber Hills. New kitchen w granite, SS appl & maple cabinets. New master bath! Oversized garage for all your toys! Don't miss the bonus room accessed thru the wall left of the FR frpl. Welcome to 1705 Green Crest Drive in Victoria! This immaculate townhome overlooks the ninth tee box at Deer Run Golf Course. Main level master suite, newly updated kitchen, beautiful woodwork and built-ins throughout, lovely deck, and tons of storage. All the amenities you need! Click here for Property Details. Open House this Sunday, 5/17, 11:00 am-1:00 pm. 13754 46th Lane NE, St. Michael - Price Reduced! Outstanding W/O ranch w/lots of space inside & out. End of cul-de-sac location! Beautiful yard w/terraces & trees for enjoying summer evenings. Huge, finished LL w/entertainment area, kitchen & room for a pool table! Open floor plan on main level.